If there is one thing that’s true of most of the movies in the Marvel Cinematic Universe, it’s that they have life and spirit to spare. It’s a kind of an intoxicating joy that dares even the most comic book-apathetic to get onboard and delight in the spectacle, and it usually comes down to the characters. You might not care about whatever Earth-threatening foe is at large this time, but you care about Captain America, Black Panther and Black Widow and enjoy spending a few hours with them. I spent over two hours with Captain Marvel/Carol Danvers and I still have no idea what her personality is. Sure, there’s a lot more going on in “Captain Marvel ,” but it’s a pretty egregious failing considering that the creative bigwigs at Marvel had 10 years and 20 films to work it out. 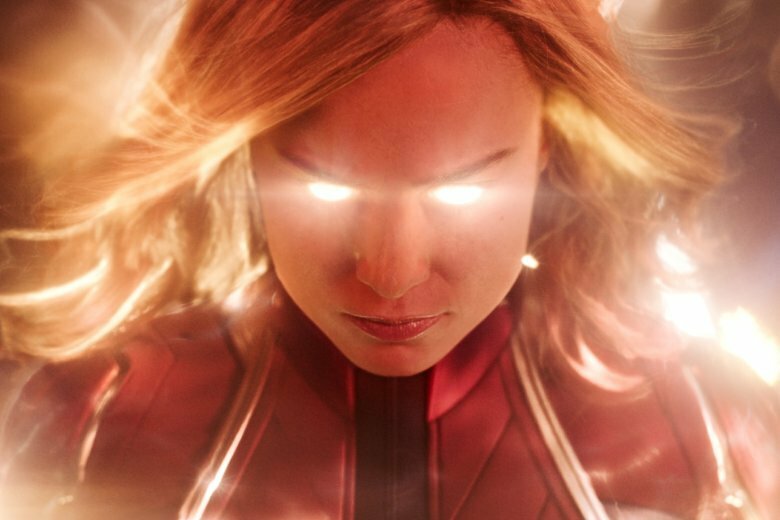 It’s hard to say whether that’s a flaw in Brie Larson’s performance or a failure of the script, but I came out of the film from writers/directors Anna Boden and Ryan Fleck not caring all that much about her beyond what her dazzling powers might mean for the next Avengers film, which is perhaps the lamest way of all to experience these movies. The story drops you in the middle of things and gives Carol Danvers a convenient case of amnesia as she tries to piece together her past by dreaming of Annette Bening while training to be a soldier with Jude Law on the planet of Kree. She is told at least 10 times in the first 10 minutes of the film that she needs to control her emotions, mostly by Law. This is a charged thing to say to a woman, but also confusing because “emotional” is the last word I would use to describe the character as she’s presented. She’s more impulsive and bullheaded than anything else. Emotions and heart don’t seem to have anything to do with her decisions. At times it even seems like she’s channeling the Terminator. But this is also a script that has Larson delivering eye-rolling lines like “enough of your mind games” with a straight face. She’s a great actress, but that’s a tall order for the best of them. The film is meant to be disorienting, especially at the beginning. She’s confused and so the audience must be too, I guess? But things start to come together when she crash-lands on Earth in the middle of a Los Angeles Blockbuster Video somewhere around 1995, which you know because there’s a “Babe” poster and a cardboard display for “True Lies.” The filmmakers have fun with all their mid-’90s references from computers to musical cues (if you like angry ’90s girl pop anthems you’re in luck), but I wish someone would have been paying that much attention to the continuity of Larson’s curls, which change even in the middle of scenes. In LA, she comes across a young Nick Fury, played by a digitally de-aged Samuel L. Jackson, whose infectious liveliness is a godsend. Together they try to both track down shapeshifting alien invaders called the Skrulls (led by Ben Mendelsohn) and also get answers about her past, which honestly sounds a lot more interesting than her present. But this is the origin story they went with and it does not include Bening teaching Larson how to fly a fighter plane. The first female-led movie of the MCU deserved more. “Captain Marvel,” a Walt Disney Studios release, is rated PG-13 by the Motion Picture Association of America for “sequences of sci-fi violence and action, and brief suggestive language.” Running time: 124 minutes. Two and a half stars out of four.